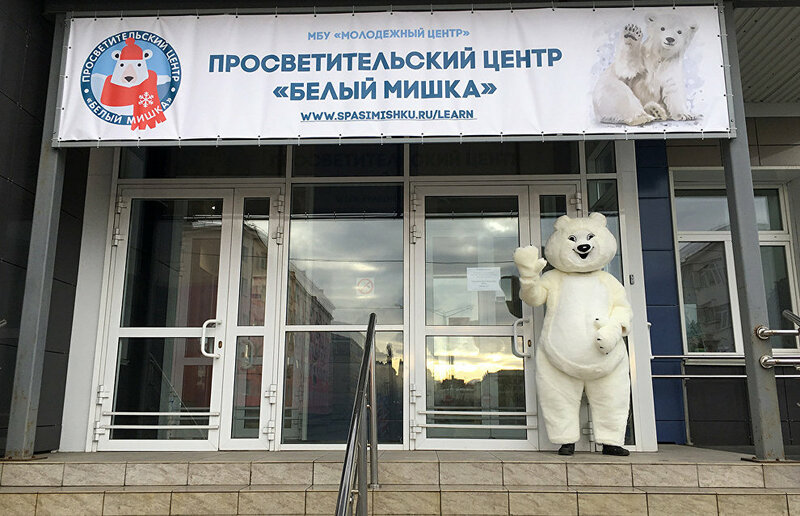 At the Bely Mishka (Polar Bear) education center, first- and second-grade school students will be able to learn more about the importance of preserving the polar bear. The center, which opened on October 4 in Norilsk, will host its first class on October 15. There, visitors will be able to use virtual and augmented reality technologies. The center is planning to teach free classes to an average of 400 children per year. The organizers say that next year, they might introduce classes for third- and fourth-grade students. As of today, there are 67 classes scheduled to be held throughout the entire school year. This modern facility is equipped with color printers, tablets, and virtual and augmented reality devices, and is fit out with software that was specially developed for this project. The rooms have folding tables, so that classrooms can easily be turned into a space for hosting children's art exhibitions or contests. All classes held here will be recorded and posted online. This center opened at the Project Office for Arctic Development in collaboration with Northern (Arctic) Federal University's environmental foundation. In the future, the organizers are planning to open similar centers in all Russia's Arctic regions, said the Project Office for Arctic Development's manager, Olesya Kuzhel. "In a year or so, there will be similar centers all over the Russian Arctic, with Norilsk being the pioneer among them," Kuzhel said. "I hope this project will be useful for the children of Norilsk, first and foremost. We are talking about raising environmental awareness through creativity, and not through just the traditional art forms like sculpting or painting, but through the modern ones as well." According to the predictions of international organizations, by 2050, the polar bear population may decrease by 30 to 60 percent, she added. "The goal of this center is to instill a love for this species in kids from early childhood, so that in the future, they will care about preserving it from a very early age," Kuzhel said. During the project presentation held for journalists, the center conducted its very first class. Visitors learned how to make animated videos with the help of tablets and create origami icebreaker models. They also found out about virtual and augmented reality devices' operation. Upon the development of the curriculum, organizers strived to combine entertaining activities with computer-based educational technologies, said Roman Laletin, a board member of Siberian Federal University's environmental foundation.